FILE - A worker hangs a road sign that directs traffic to the U.S. Embassy, in the area of the U.S. Consulate in Jerusalem, May 7, 2018. With the opening Monday of the U.S. Embassy in Jerusalem, the region is bracing for both celebrations and unrest. The United States plans to host about 800 guests at an opening ceremony of its embassy. U.S. President Donald Trump's daughter Ivanka and son-in-law, Jared Kushner, will be on hand, while Trump addresses the ceremony via video, reaffirming his December 2017 decision to move the American embassy from Tel Aviv. "I have determined that it is time to officially recognize Jerusalem as the capital of Israel," Trump said at the White House late last year. "While previous presidents have made this a major campaign promise, they failed to deliver. Today, I am delivering." National Security Advisor John Bolton points out that other presidents also said they would move the U.S. embassy to Jerusalem, but Trump is the only one to do it. "That’s not simply something that has an effect on the conditions in Israel, but it says to world leader all around the world, when he says he’s going to do something, he does," Bolton told VOA on Friday. Most of the 850 U.S. Embassy workers will remain in Tel Aviv until a new embassy building is constructed in Jerusalem. Fifty of them will make up the initial staff at the new embassy, including U.S. Ambassador David Friedman. Experts say the move is largely symbolic. But with Palestinians wanting to name East Jerusalem as a capital of their future state, this symbolism matters. Khaled Elgindy of the Brookings Institution notes both Republican and Democratic administrations have resisted moving the U.S. Embassy for the past 70 years. 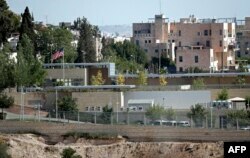 FILE - This partial view shows the U.S. Consulate situated in the area between West and East Jerusalem, which will be used as a temporary new U.S. Embassy starting May 14, 2018. "The United States, like most countries in the world, have maintained an embassy in Tel Aviv, rather than in Jerusalem, precisely because of the highly contentious nature of the issue of Jerusalem for Palestinians, for Israelis, for the Arab world, for the Muslim world, for Christians around the world, and of course for Jews as well," he said. Elgindy said the move was centered on U.S. domestic politics, namely a campaign pledge Trump made to his core supporters. "There is no national security interest that is gained by moving the embassy — to the contrary," he said. "I think it destabilizes the region. It adds a level of instability and it also makes it much harder to negotiate peace between Israelis and Palestinians." Palestinians have protested Trump's decision and are calling for more demonstrations next week. They want East Jerusalem, which Israel captured in the 1967 Middle East war, as the capital of their future Palestinian state and feel that Trump gave away the "crown jewel" of peace negotiations. Senior Palestinian official Nabil Shaath said Trump shattered any hope for the peace process. "What [Trump] has done is blow out the possibility of a peace process that was really never completed," Shaath said. Palestinian officials are no longer accepting the U.S. as a mediator, while Israeli leaders see the U.S. Embassy in Jerusalem as a long-held dream come true. Israeli Prime Minister Benjamin Netanyahu said the move would have long-term, positive ramifications. "This is a great moment for the citizens of Israel and this is a historic moment for the state of Israel," Netanyahu said during an Israeli Cabinet meeting in February. A Muslim protester plays with a portrait of U.S. President Donald Trump with horns and fangs as they try to march toward the Israel Embassy to protest against Trump's decision to recognize Jerusalem as the capital of Israel in metropolitan Manila, Dec. 21, 2017. Asked what concessions the United States had won from Israel in exchange for the move, a senior administration official said that was not what the decision was about. It was about doing what is best for America's interests, the official said. "There was no give-and-take with Israel with regard to this decision," the official said during a background briefing with reporters. The official said the Jerusalem embassy would be opening just five months after the president announced the decision, adding, as the president likes to say, "ahead of schedule and under budget."